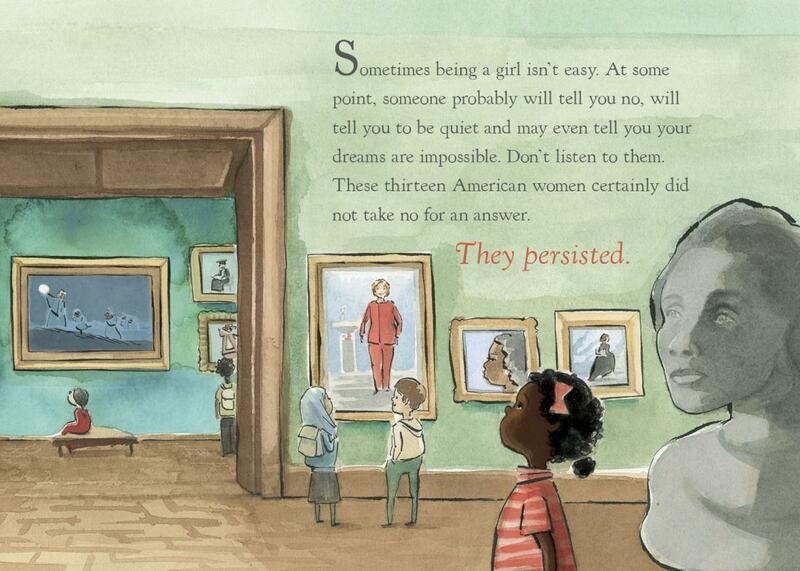 Chelsea Clinton’s children’s book She Persisted, reviewed. If the broken heart of the Clinton campaign wrote a kids’ book, this would be it. That article posited that the lot of Chelsea Clinton was to “have parents … who loom so large that it remains impossible for you to write a story of your own.” With her recent salty subtweets of 45 and his cronies, Chelsea seemed to express a more personalized, even quirky, allegiance to her mom. But now, she has come out with a children’s book, She Persisted, that feels like a pure distillation of an inherited feminist worldview. If the Hillary Clinton campaign were governed by a single human intelligence, and that intelligence sat down to write kid’s literature shortly after the 2016 election, this would be it. Wistfully and delicately illustrated by the watercolorist Alexandra Boiger, it is based on a feminist meme that originated with Elizabeth Warren: “Nevertheless, she persisted,” was Senate Majority Leader Mitch McConnell’s dismissive characterization of the Massachusetts senator, whom Republicans voted to formally silence as she was reading a letter from Coretta Scott King about Jeff Sessions’ stained civil rights record. The book submits the tales of 13 inspirational American women who—to use the recurring language of the copy itself—overcame adversity to realize their dreams. In a statement, the younger Clinton explained that she hoped She Persisted would serve “everyone who’s ever wanted to speak up but has been told to quiet down … everyone who’s ever been made to feel less than.” The book’s circle of wonder women includes Harriet Tubman, Helen Keller, Nellie Bly, Ruby Bridges, the ballerina Maria Tallchief, and the sprinter Florence Griffith Joyner. Each character receives a two-page spread, with a description of her accomplishments and the obstacles she surmounted to attain them. (Margaret Chase Smith “persisted in championing women’s rights and more opportunities for women in the military, standing up for free speech and supporting space exploration.” Claudette Colvin “was expected to give up her seat to a white woman just because she was African American. In her refusal to get up, she persisted in taking a stand for what’s right.”) The book introduces the women as framed pictures in a portrait gallery being toured by contemporary girls. Hillary Clinton is there, in her own painting, all smiles and wearing a smart red pantsuit, though she doesn’t get an individual chapter. It is a lovely and sad fantasy, this existential feminist museum, in which the heroes of American womanhood congregate to cheer each other on. It is also, it is worth noting, a dramatically different fantasy than the one Ivanka Trump promotes. (To start, Boiger’s tender palette doesn’t offer much in the way of metallics.) In her own stab at a feminist manifesto, Women Who Work, Chelsea’s former friend underlines the importance of “architecting a life you love—a full, multidimensional life.” Clinton’s role models, by contrast, desire more than personal fame and fulfillment; they strive toward social goods like civil rights and better care for newborns. She Persisted is a devoutly socially conscious and progressive book, with a diverse cast of characters and a gentle, earnest didacticism. There is no revolutionary call to remake society, but there is a pressure to improve it. “Remember these women,” Clinton exhorts toward the end. “They persisted and so should you.” Perhaps the events of 2016 remain too present to my ear, but this sounded almost plaintive to me, a plea on behalf of our clean-hearted, obstructed ancestors: Don’t let them have aspired in vain. Conscientiousness, in art, can sometimes read as the consolation prize for a lack of inspiration—a fact that serves neither Chelsea nor Hillary Clinton well. They aren’t so much charismatic or stirring communicators as dutiful ones, dedicated to getting the words right for the sake of combating wrongs. The Clinton women’s glamor deficit—which seems at least partially willed—dovetails curiously with what my colleague Michelle Goldberg has called a moment of “female chastening.” In the Trump era, Americans have realized just how hostile to girlhood our country has always been. She Persisted, with its stories of discrimination and hardship, situates its protagonists squarely in that adversarial world, where grit matters as much as genius. The book may be positive, but it is not cheerful. It is far more interested in women’s tenacity in the face of obstacles than in the substance of their dreams. What’s more, feminism comes across as a fairly lonely project. Clinton’s portraits rarely acknowledge the friends or communities that may have helped these strivers along their difficult paths. Even Helen Keller’s blurb doesn’t mention Anne Sullivan by name, though an illustration depicts the teacher leaning over her student next to the Keller quote “One can never consent to creep when one feels an impulse to soar.” When aid or inspiration arrives in She Persisted, it flows vertically and not laterally: from the past and future rather than the present. Chelsea likes to draw out continuities between then and now: Virginia Apgar created a score “to test a newborn baby’s health, which hospitals all over the world still use today,” she writes. Harriet Tubman passed a baton to Claudette Colvin, who passed it to Rosa Parks, who set it on fire, tossed it into the Alabama dirt, and ignited the modern civil rights movement. History is a potluck, the collective achievement of generations coming together with their hard-won gains. But you have to cook alone. Leave it to Chelsea Clinton to place such an emphasis on lineage. She may never outrun her identity as first daughter, but she has also become a mother; She Persisted feels alert to and solicitous of the future, and not just because it’s intended for young readers. The book seems to want to console itself with a vision of linear sisterhood in the wake of a failure of horizontal sisterhood—a moment when American women declined to bond together to elect one of their own. The last page of the book features one of the small museumgoers, a black girl with a jaunty bow in her hair, standing beneath an image of her adult self behind a podium marked “President.” The incremental triumphs of bygone women have led her to this reverie. Their spectral hopes rest on her shoulders. The road won’t be easy. The girl wears a serene, determined expression; her gaze angles up. Still, I wonder if Clinton knew how sad it would look. She Persisted by Chelsea Clinton. Philomel Books.